This gorgeous chunk of cheese is from Henning’s Wisconsin Cheese. 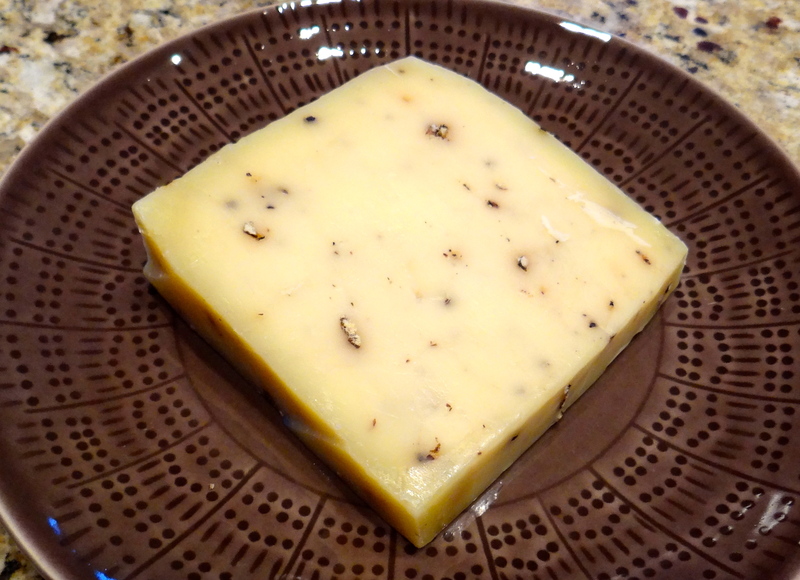 Put this 2012 World Cheese Contest winning peppercorn cheddar on your “must-try” list. Fine cheese should not be eaten straight from the refrigerator, but first brought to room temperature. The peppercorn cheddar took almost two hours to warm, but it was definitely worth the wait. The aging process creates a cheese that is firmer and dryer than fresh cheese, and develops more complex flavors. The generous sprinkling of cracked peppercorns adds a nice spicy bite to the cheese. Although I’m certainly no tasting expert, it seemed there was a hint of parmesan flavor in the cheese, and Henning’s website suggests adding the cheese to Italian pasta or salads. That idea is worth exploring. Kerry Henning is the third-generation cheesemaker in this family business established in 1914. He has earned the Wisconsin Master Cheesemaker designation, which is a complicated process of being licensed for at least ten years and having at least five years of experience in making the cheese one is “mastering” in. Kerry has mastered in Cheddar, Colby and Monterey Jack and his cheeses have won numerous awards. Kerry’s father, Everett, remains involved in the business, and was the driving force behind the family’s cheese museum and store. It has a display of vintage cheesemaking equipment, offers large viewing windows onto the factory floor to see the cheesemaking process, and of course, has Henning’s cheeses for sale. Oh, and fresh, warm cheese curds are available every weekday! This successful family business is approaching the century mark. Their website has a list of retailers where you can find their cheeses, and there is also an online store that offers cheese, sausage, candy, and other products.